Research in the Zhao group focuses on the rational development of transition metal-based catalytic methods for chemical synthesis. A long-standing goal is to explore transition metal-mediated activation of strong chemical bonds such as carbon-hydrogen, carbon-carbon, and carbon-heteroatom bonds to form reactive organometallic species in homogeneous catalysis. “Classic” organometallic chemistry often generates catalytically active intermediates by oxidative addition of organic halides or by transmetalation with main-group organometallic compounds such as Grignard or organolithium reagents. In comparison, C-C and C-H bond activations have facilitated the development of new catalytic processes without the need of using halides or main-group metal reagents. As a result, these reactions not only extend homogeneous catalysis to a much broader range of available starting materials, but can also reduce the generation of undesired salt waste and are therefore more environmentally friendly. Thus, a major focus for our catalyst design is to develop new catalytic processes that feature high atom-efficiency, reduced waste production and mild reaction conditions to minimize harmful impacts on the environment. We are actively seeking synthetic applications of our catalytic methods including asymmetric catalysis, drug development, and material synthesis. 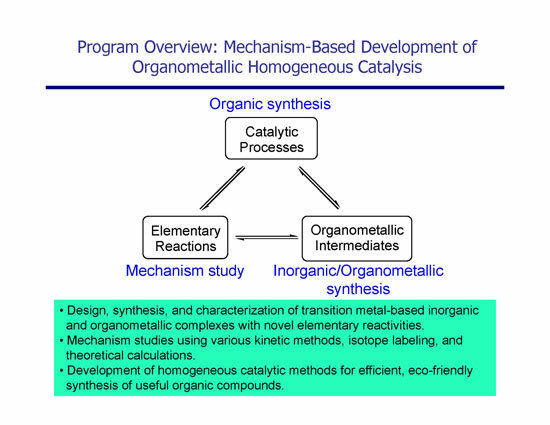 A major theme of our research program is the design, synthesis, and structural characterization of novel organometallic complexes proposed as reactive intermediates in homogeneous catalysis. The elementary (single-step) reactions of these isolated complexes will be subjected to detailed mechanism investigations using NMR kinetic methods, isotope labeling studies, and DFT calculations. These stoichiometric studies will elaborate structure-reactivity correlations in catalysis and provide insights into fundamentals of organometallic chemistry. A variety of methodologies for organometallic synthesis and kinetic studies have been successfully explored in our lab and we will continue to extend our synthetic expertise for ligand and catalyst development. Through collaborations with computational chemists, we also utilize DFT calculations to provide mechanistic details (e.g. structures and free energies of transient reactive intermediates and transition states) that are elusive to experimental methods. Our current research activities are directed towards the following main projects: (1) Catalytic decarboxylation and reaction mechanism study; (2) Domino catalytic reactions by C-H bond activation and C-C coupling; (3) Atom-efficient catalytic methods for N-heterocycle synthesis; (4) Biomass-based monomer synthesis for sustainable polymer materials. Our research bridges areas of organic synthesis, inorganic and organometallic synthesis, homogeneous catalysis, and reaction mechanism studies. It provides interdisciplinary research training and career preparation at undergraduate, graduate, and postdoctoral levels. Students will have opportunities to disseminate their research results in peer-reviewed journals and at domestic and international scientific meetings. Congratulations to Jing Zhang (4th year GS) for her recent awards including the ND EPSCoR Doctoral Dissertation Fellowship, ACS Division of Inorganic Chemistry Travel Award, and a poster award at the OMCOS17 conference in Colorado. Great work Jing! Our group is part of a ND-SD scientist team that has been awarded a $6 million grant to establish the Dakota Bioprocessing Consortium (DakotaBioCon). More news to come on this exciting collaborative research! Our group’s grant application to NSF Chemicl Catalysis has been funded for $410,000 over the next 3 years. GREAT JOB everybody! Jing Zhang’s (4th Year GS) paper on Ru(II)-catalyzed ketimine/alkyne [3+2] coupling has been published online at Angewandte Chemie International Edition. Congratulations! Zhang, J.; Ugrinov, A.; Zhao, P. “Ruthenium(II)/N-Heterocyclic Carbene Catalyzed [3+2] Carbocyclization with Aromatic N-H Ketimines and Internal Alkynes.” Angew. Chem. Int. Ed. 2013, 52, 6681-6684. Link. Sun, Z.-M.; Zhang, J.; Manan, R. S.; Zhao, P. “Rh(I)-Catalyzed Olefin Hydroarylation with Electron-Deficient Perfluoroarenes.” J. Am. Chem. Soc. 2010, 6935. Link. Sun, Z.-M.; Zhang, J.; Zhao, P. “Rh(I)-Catalyzed Decarboxylative Transformations of Arene-Carboxylic Acids: Ligand- and Reagent-Controlled Selectivity towards Hydrodecarboxylation or Heck-Mizoroki Products.” Org. Lett. 2010, 12, 992-995. Link. Fluorinated Benzoic Acids: Stoichiometric and Catalytic Transformations.” Angew. Chem. Int. Ed. 2009, 48, 6726-6730. Link.